Reading and share top 6 famous quotes and sayings about Historical Thinking by famous authors and people. Browse top 6 famous quotes and sayings about Historical Thinking by most favorite authors. 1. "Two things are to be remembered: that a man whose opinions and theories are worth studying may be presumed to have had some intelligence, but that no man is likely to have arrived at complete and final truth on any subject whatever. When an intelligent man expresses a view which seems to us obviously absurd, we should not attempt to prove that it is somehow true, but we should try to understand how it ever came toseemtrue. Thisexercise of historical and psychological imagination at once enlarges the scope of our thinking, and helps us to realize how foolish many of our own cherished prejudices will seem to an age which has a different temper of mind." 2. "Why vampires? 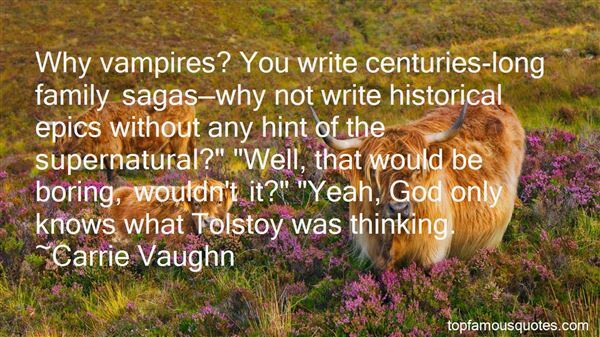 You write centuries-long family sagas—why not write historical epics without any hint of the supernatural?" "Well, that would be boring, wouldn't it?" "Yeah, God only knows what Tolstoy was thinking." 3. "Historically, WordPress has been purely focused on the writing side. However, we're thinking about mobile completely differently, and I think there's a big opportunity to take the community of creators that loves WordPress and deliver an audience to the amazing things they're making." 4. 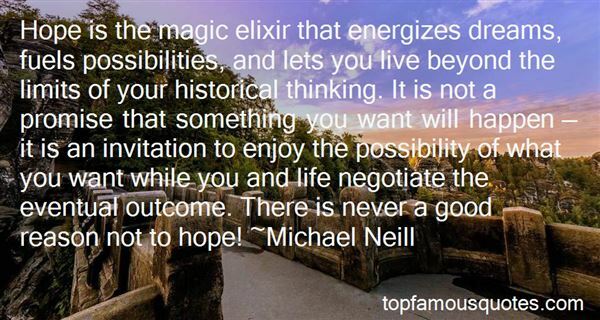 "Hope is the magic elixir that energizes dreams, fuels possibilities, and lets you live beyond the limits of your historical thinking. It is not a promise that something you want will happen — it is an invitation to enjoy the possibility of what you want while you and life negotiate the eventual outcome. There is never a good reason not to hope!" 5. 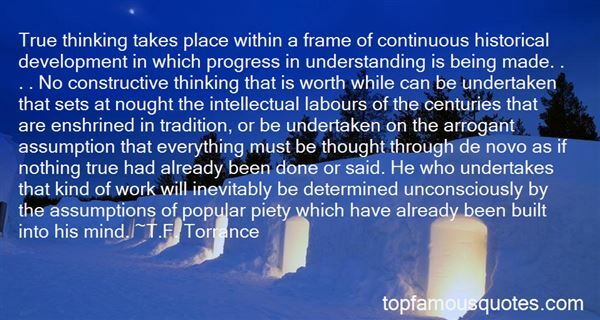 "True thinking takes place within a frame of continuous historical development in which progress in understanding is being made. . . . No constructive thinking that is worth while can be undertaken that sets at nought the intellectual labours of the centuries that are enshrined in tradition, or be undertaken on the arrogant assumption that everything must be thought through de novo as if nothing true had already been done or said. He who undertakes that kind of work will inevitably be determined unconsciously by the assumptions of popular piety which have already been built into his mind." 6. "When the Bible is understood in its literary and historical context; errors, contradictions, and inconsistencies pose no threat to spirituality, whether that spirituality is theistic, non-theistic, or even explicitly Jesus-centered. The graver threat to what Christians call godliness may be fundamentalism - religion that flows from literalism and fear, religion based on anachronism and law. Fundamentalism teachers, in effect, that the tattered musings of our ancestors, those human words that so poorly represent the content of human thinking, somehow adequately describe God. Fundamentalism offers identity, security, and simplicity, but at a price: by binding believers to the moral imitations and cultural trappings of the Ancients, it precludes a deeper embrace of goodness, love, and truth - in other words, of Divinity." Show me any health professional - great and not so great - who says they don't make mistakes or haven't made one in years, and I'll show you someone who has trouble admitting the truth."